This image was taken from a collection of antique postcards all from Greene County, NY. American Masquerade is a series of exhibitions, performance, workshops, community dialogues, book and DVD exploring masked identities with a sense of place inspired by the Catskills' Colonial Anti-Rent Wars overthrow of the old-world feudal system. Collaborations feature a historical exhibition & a flash mob street performance (Jean Fleming, Director) with local musicians/dancers reviving the 1840's 'Calico Indians' rebellion by masked tenant farmers; contemporary exhibit and lecture series links American social issues to European, African & Native American narratives and shifting dynamics in class/gender/nationality; masked Baroque pastoral opera (Andrew Appel/Four Nations Ensemble); and exhibit connecting American masquerade festivals (Mardi Gras/ Halloween) to their global origins. 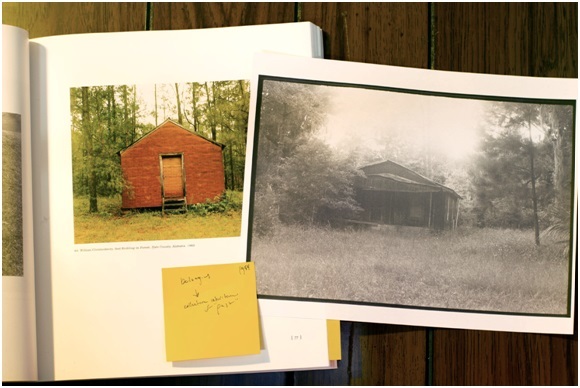 Four Catskill arts centers partner on a year-long project engaging established & emerging artists (Lyle Ashton Harris, Jack Pierson) with area residents across Greene County’s undeserved rural communities. 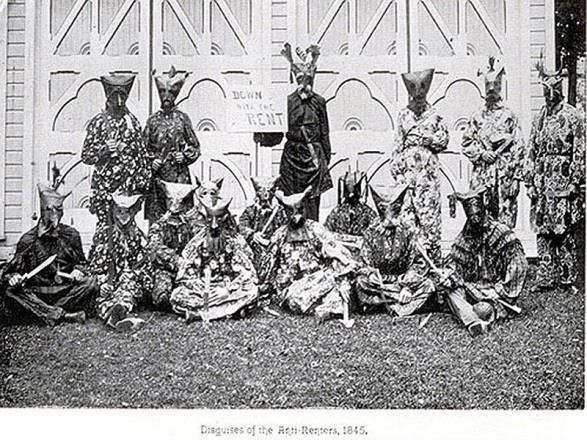 In 1839, in the Helderberg mountains of New York State, tired of paying rent on land they would never own, donned frighteningly decorated burlap masks, dressed themselves in colorful costumes made from their wives’ calico dresses, took up their dinner horns as if they were clarions and armed with rifles, rose up again the landlords who oppressed them. Disguised as Indians, they formed tribes, appointed chiefs, and held secret meetings. 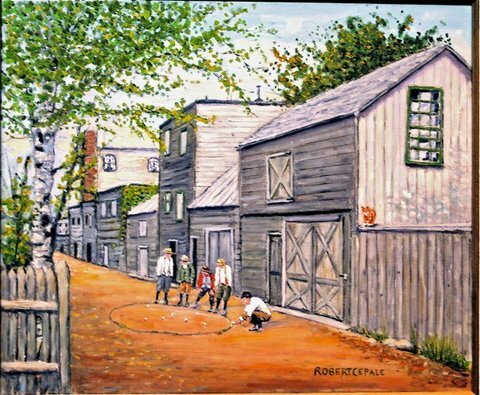 The class “war” of poor versus rich lasted until 1845 when, in the Catskills’ town of Andes, someone shot the sheriff and there was hell to pay. This little-known historical event, known as the Anti-Rent Wars of New York State, was not the first time that self-proclaimed Americans had fought for freedom. In fact, the Anti-Rent Wars would become the Nation’s third revolution from the shackles of Europe, initiated by some of the same men who had fought in the War of Independence and the War of 1812, America’s first two revolutions. Calico Indians Flashmob Saturday, July 4, Catskill, NY. Masked rebels wearing their wives' calico dresses from the 1840's Catskill Mountain farmers' revolt bring the Anti-Rent Wars to life. Calico Indians Flashmob August 15, Haines Falls, NY. Masked rebels wearing their wives' calico dresses from the 1840's Catskill Mountain farmers' revolt bring the Anti-Rent Wars to life. Calico Indians Flashmob August 29, Prattsville, NY. Masked rebels wearing their wives' calico dresses from the 1840's Catskill Mountain farmers' revolt bringing the Zadock Pratt Museum's Anti-Rent Wars Exhibition to life. Contemporary Masks Art Exhibit at the Catskill Mountain Foundations Kaaterskill Fine Crafts Gallery. September 5-October 11. 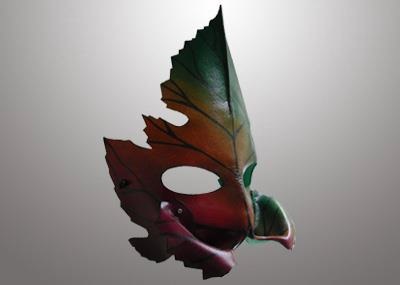 Wendy Drolma, Green Man, dyed leather mask with velvet interior, 10” x 8’. 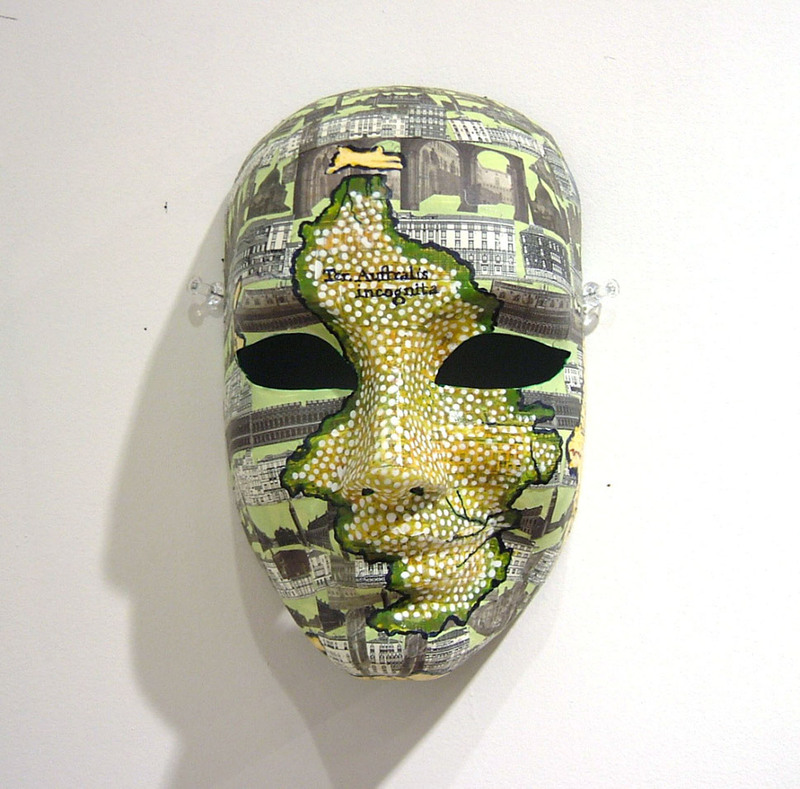 Representative work by featured artist for Catskill Mountain Foundation exhibition of contemporary maskmakers. Acis and Galatea A Baroque Opera by Handel The inspiration for "The Little Mermaid" with The Four Nations Ensemble Saturday, September 6th @ 7:30 pm @ the Orpheum Film & Performing Arts Center, 6050 Main Street, Village of Tannersville. Handel conjures up a delightful entertainment moving from giggly delight to some of the most moving and gorgeous representations of love and loss in all music. With two recorders, two oboes, two violins, cello, harpsichord and four of America’s finest soloists, the Four Nations Ensemble offers for all your labors on Labor Day weekend, a sweet shepherd and his loyal friend, a water nymph as irresistible to us as she is to the shepherd, the birds and an awkward, goofy, besotted Cyclops who ultimately proves fatal to all joys. 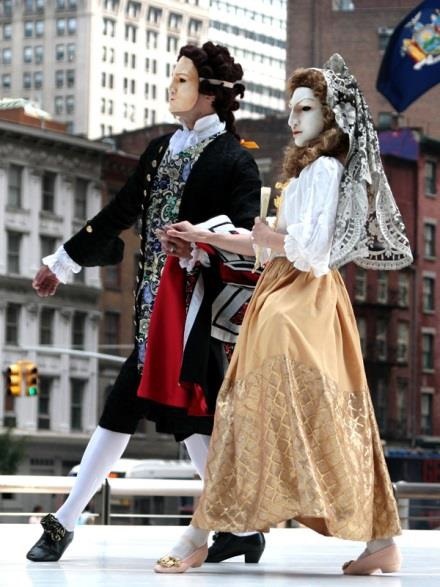 Musicians, dancers and singers are all masked in this family-friendly opera. Tickets purchased ahead (up to 5 hours before the performance) are $25; $20 seniors; $7 students. Tickets purchased at the door are $30; $25 seniors; $7 students. Tickets: www.catskillmtn.org or 518 263 2063. Come visit the Great Northern Catskills. We're a short day trip from New York City and all points from the Mid-Atlantic to Maine.